Offshore projects are filled with peaks and valleys-just like a season of training. Unfortunately both my project and training plan are peaking out at the same time! For the last three days workdays have stretched late into the evening. Then followed by a strength workout that has stretched the evening even later. These strength workouts are leaving me very tired. After training, its immediately off to sleep. Sleep time has been at a premium this week. Lunchtime naps rawk - and refresh! Although my days have pushed deep into the night, its hard to imagine not having the balance and release training provides. That said, tonight is time to catch up on home chores and social activities. I have a lot of catching up to do on those two fronts! No work, no training, early bedtime. Perhaps a few happy hour beers, first. I have a long-time tradition for relaxed Sunday mornings. I like to make a delicious breakfast, some strong coffee, put some good music and just flat chill for an hour or so. I got up eager to enjoy my morning, then go for a ride. Coffee brewing, breakfast cooking, music - uh-oh. I loaded up a couple of discs in the CD player, and close the tray to hear a crunching and grinding sound. Then the display started blinking, and it turned itself off! YIKES! I just loaded up a couple of my all-time favorite CDs. I had to get them out. And I wasn't going to let this ruin my Sunday - Hell no! I pulled the player off the shelf, and was completely undaunted by the following warning. The CDs got scrambled around and jammed up the tray. A quick tap and it was freed and working again! My house was once again filled with music! Ahhhhh! With all the recent rains, Huntsville was iffy for today. I decided to take an impromptu trip to Double Lake. LakeLake drains and dries really fast. Step two, drive to LakeLake. Step three, ride! I like the trails up here, enough. They are really easy, with almost no roots. They ride really fast as a result. A lot of the trail is pretty bermed in, so you can nail-and-rail the turns pretty good. It's twisty, so, its a great place to work on turning skills. Only two laps, I got a late start. Ouch. Luckily the delay was short! There's Something Up In The Sky! I'm going outside to check out this big, bright, warm, ball of light that's up in the sky. I heard someone say it's called "Sun". I vaguely remember it, but it's been a long time! YEEHAA! JazzFest lineup is >HERE<. The first weekend is... well... underwhelming... Hopefully there will be some good afterhour shows to fill in the gaps... Second weekend with Trombone Shorty and DUMPSTAPHUNK looks promising! This is the first year in a while that I'll be doing the entire week. I can't wait for spring ot get here! But this looks like too much fun to pass up!!! ROAD TRIP!! Whats more boring? 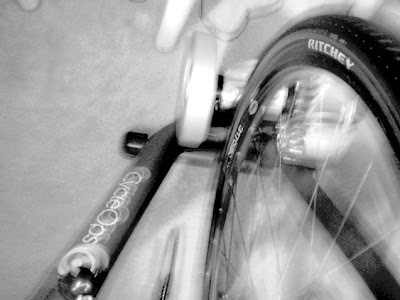 Spinning on the trainer, writing about it, or reading about it? Friday and Saturday were speed drills on the trainer. Actually, the trainer is helpful. Spin-ups and Form Sprints are best done on the trainer anyway. Hope to get an outdoor ride in today, if I don't blow up the legs in the gym this afternoon. I didn't make an entire R&R week. Saturday I went for a pretty long ride up the TC Jester trail that runs along White Oak Bayou. This was the first time I've ridden this path, but it won't be my last. No training goals for this ride... it was R&R week afterall, so I JRA'ed. Sunday, I got up early to catch Jane running her first marathon. She finished, and congrats to her! I don't know how people have the stamina to do it, but I think it's awesome! Monday was an outdoor ride, that ended up going 3+hours. It was combined ride of endurance tempo, force, and speed workouts. It felt good to get back in the groove again. I get bored on long endurance tempo rides. But when punctuated with some higher efforts the time just flies by. Tuesday was an indoor trainer ride - also Wednesday. Trainer, oh trainer... oh how I hate thee! Ok, I don't hate the trainer, but I'd really prefer being outdoors - just not when it's raining and in the 50's. Wednesday was a short ride, because I had other business to attend to. My training ride was short so I could get to the hospital. My long-time friends Todd & Amanda had their second daughter Reagan on Tuesday. Naturally, she is as cute as can be! Amanda was doing great - impressively great considering the efforts of the day! I even got to hold baby Reagan for a while. I don't think one can contemplate a single problem in world when holding a newborn baby! Is there anything more peaceful? For me doing the weights thing is just - boring! But it's also necessary. I got in a gym workout Tuesday and Wednesday nights. Tuesday being abs and core muscle groups and Wednesday was arms, back, and shoulders. I've resolved myself to 3X a week for the next 8 weeks and then re-evaluate where I'm at. I want to make a long ride this weekend. Weather forecast doesn't look good though. At best, it will be cold. Perhaps, its time for me to HTFU and get out in the cold! The training plan I revised back in November called for one more week of training before an R&R week. Normally, I'd plan 3-weeks of training then 1-week of R&R. But back when I revised the plan, I'd taken an extended break for some bike repairs and to work on the car. I planned 5-weeks straight to "catch-up". This was supposed to be that 5th week. I'm feeling too washed-out. I've moved the R&R week up a week. I need the break, planned or not. I don't think this 5th week was overtraining, as much as I was in the middle of a break intentional or not. After taking Monday off for the LSU Championship game, then Tuesday off for my birthday, and Wednesday for being too tired after 4 or 5-consecutive nights of insomnia... there was no way I was getting my hours in for the week anyway. None-the-less, some strong signs of overtraining are present, in addition to feeling fatigued. I haven't had a good nights sleep since last week (insomina). I've noticed a sudden and sharp decrease in my appetite - to the point I've struggled to get my calorie requirements of food down my throat for the past two or three days (loss of appetite). I've been snippy and grumpy, too (irritability). Last night I crashed out, and I'm feeling much, much better today. Refreshed. For a fun and wonderful season of football. I got my birthday present one day early! - Went for a 3+ hour ride on Saturday. - Ordered a new GPS unit for the bike, because I'm tired of my HRM being on the fritz. - Saw the MR2 in daylight for the first time. It looks OK.
- Shaved off the runs using a run razor. Neat tool. - Wet sanded most of the car, taking down the orange peel texture, and dirt nibs. I did not sand through the clearcoat. I really like the DCU2021. It is very, very hard. - Debated, but did not decide either way, reshooting the roof and rear deck lid with another coat of clear. - Roasted a chicken, flavored with lemon juice, grated ginger, garlic, tumeric, coriander, garam masala, salt and pepper. - Ate the chicken with brown rice. Yum. Not only on the football field, but for custom bicycles too! Don't put food cooking while trying to do an indoor trainer ride. You will get very hungry during your "ride"! I did this last night. Mistake. Even though it was only rice cooking the smell of food combined with a tough interval ride made me very hungry! Made a quickie dinner. This started out as a receipie for vegetarian mexican rice cassarole, and ended up as chicken and rice burritos. I cubed, and stir-fried some rum-marinated chicken breasts. This is the second time this week I've used rum to marinate chicken. I like the combination. Next came chopped onions, chili peppers, green onions, cilantro, and shredded jack cheese. Added rice to this and mixed up. Sour cream, cumin, salt, and pepper - mixed together, then combined with the rice and chicken in a bowl. I put this in a cassarole dish and heated it in the oven until the cheese was melted and it was warmed through. And served in warm tortillas. Hard to believe 2008 is already here. It seems like just yesterday we were all certain the end was near because of the millenium bug. Remember that? I suppose global warming *cough*, sorry, climate change is the new millenium bug. It seems that some people just need something to be fatalistic about? The optimist in me says: Screw that, 2008's gonna be a great year! The ride plan worked out excellent. The wind was a strong 18 - 20-mph, so I used this to my advantage. I rode the higher effort portion of the cruise interval into the wind. My cruise intervals turned into more of a force-level workout! Looking through Friels' descriptions, the efforts seemed more like hill repeats than cruise intervals. Without the hills of course! The legs felt really, really, good. At about the 1:45 mark, I noticed my rear tire was almost flat. I was cold, anyway, so I just gave it a shot of CO2 and booked it for the house. Barely made it as the tire was low again. Finished off the ride with some hot chocolate, yum! Overall, an excellent training experience! 2008's off to a great start!